A north Belfast republican activist who was arrested and twice refused bail on an unsubstantiated charge of rioting early this summer, was finally released on bail this week. A commentary from Sean MacDiarmada (1916 Society Ard Eoin). The end of this years tramping season has brought more to the people of North Belfast than the usual relief and easing of tensions. It has delivered yet another Statement of Intent from the British administration in Ireland directing a future of oppression and unimaginable terror under the dominance of localised British command. Alan Lundy was granted bail by a British judge in a British court earlier this week. He was on Roe 4 when the news broke. On Roe 4 in Maghaberry Gaol Republican men, interned for being republican men, live tortured and engaged in brutal protest imposed by their Gaolers. It is a place where a whole new world of depravity exists which is little understood by those of us who have never experienced its unimaginable wrath. The impact prison has on the vital routine that binds cohesive family life occurs at the point of imprisonment. Being hauled from your home unexpectedly and without reason or explanation, cast in to prison with no way to ease the rising fear of your loved ones, is surely one of the most traumatic experiences a human being can endure. Trauma is an immediate consequence of the internment process and thus the effect can not be stilled or stayed by eventual release or time. Alan Lundy will be congratulated on being home. Every time such a welcome is made his mind will naturally return to those he walked the yard with in Maghaberry, those who know no other home than hell today. Gerard McManus, 3 years interned and almost 3 years on protest, still no trial, entrapped and tortured along with the countless others who laugh and joke their pain away in a hell that exists within the comprehension of only those who endure it there and then. Those who leave that unjust confinement as suddenly as they were entered into to it will have nowhere to express the affect of such trauma without that environment being replicated, and the same Maghaberry imposed isolation will exist as much outside the walls of Maghaberry and be as present on the street or in the home as it was within the yard or in the cell. How do we know this? 36 years ago Long Kesh began manufacturing the exact same psychological consequence for the generation before us, the generation that raised us and the generation whose pain lingers still; as it was silenced by Sinn Fein’s alleged need for “political progress” - or as we know it now, total capitulation. The Statement of Intent is layered with supremacy as always. Bail in this case was granted at the end of marching season. Death squads secured the union with Britain. Those who built and equipped the Death Squads have been rewarded well. 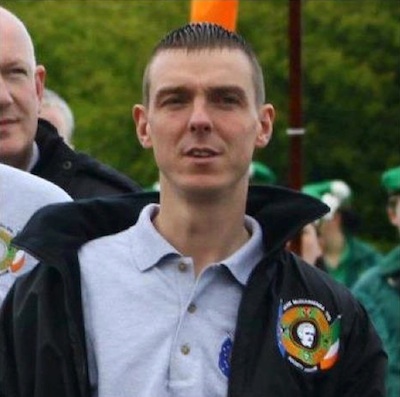 They have secured terms so extreme from the British government that they can now direct a Unionist militia against innocent nationalists and Republicans at will. Men and women deemed capable of challenging Loyalist intentions irregardless of how unlawful or harmful to the Nationalist community those intentions are, will be lifted from the street, they will be interned and tortured on the orders of the Administration and its advisors until Loyalist intentions, irregardless of how unlawful or harmful to the Nationalist community those intentions are, have been completed. We are in the grips of the greatest tide of terror witnessed in this country for over a century and it is being advertised by the terrorist, and, consumed by the majority as “peace time”. No government can ever achieve the right to intern the innocent or to disappear even temporarily the opposition voice making most progress, no government has the authority to direct torture against any human being for any reason, there is no justification in unlawfully denying the liberty of any being for a moment, but in the case of Alan Lundy this is what was laid before us, injustice after injustice imposed by unseen unknown entities, upheld by British courts and justified by the silence of Sinn Fein and the other British terrorists who claim to be democrats in order to squander British taxes on gluttony and greed. We are supposed to rejoice gleefully and without question because the British state has permitted an innocent Irish man, who they unlawfully interned, return temporarily to a home he should have never been taken from in the first place, while the so-called prosecution attempt to rescue a charge from the tatters of fabricated nonsense used to hold him for the past few months! Is this the dividend? Is this the reward? The victory? Shut your mouth or go to gaol? We had more rights in the 1940’s than we have today.